This picture was exhibited in an unfinished state at the seventh Salon des Indépendants which opened on 20 March 1891. Nine days later he was dead. The dominant red–blue–yellow spectrum of dots fuse to give a range of purples, greenish hues, and darker colours but in this, his last picture, the colour range is particularly restricted. Seurat may possibly have been reacting to the new technology of the 1880s when printing processes such as chromolithography made an appearance, using minute dots of ink to reproduce colour images. This same process was being used to produce the celebrated posters which adorned Paris in great quantities at this time, advertising all manner of products and events. And it was this ‘popular’ art (especially the work of Jules Chéret) that seems to have effected an interesting ‘cross-fertilisation’ influencing the way Seurat depicted the toy-like figures in this painting. In contrast to earlier output, depicting the outdoor leisure pursuits of middle class Paris during their Sunday excursions to the outskirts of the city (exemplified by his two huge masterpieces Bathers at Asnières and A Sunday on the Island of the Grand Jatte), in the last few years of his life Seurat concentrated (with the single exception of a portrait of his mistress) on scenes of urban entertainment. The establishment shown in this painting is the Cirque Fernando, at that time a permanent fixture at 63 Boulevard Rochechouart close to Montmartre. 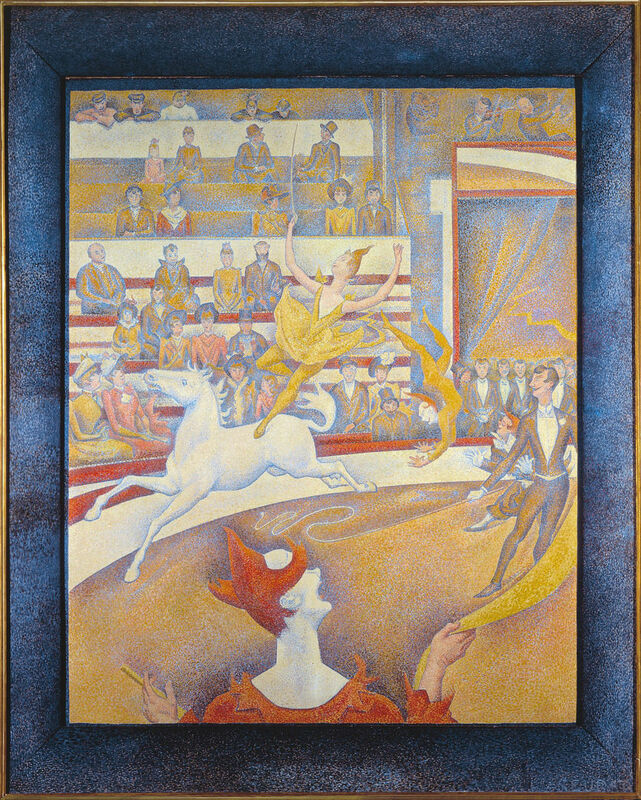 In choosing this subject matter Seurat was treading a well worn path; Degas, Renoir, Toulouse-Lautrec had all produced memorable paintings of the same circus, Toulouse-Lautrec having painted the same red-headed clown and female rider (with similarly exotic coiffures) in his 1888 painting Equestrienne (at the Cirque Fernando). The circus was a popular pastime in belle époch Paris and not just with the lower classes, the patrician Degas being a particular devotee. Had he been attending this performance, Degas would have most certainly occupied a front row seat; as Seurat has made plain, the clothing of the audience betrays their class and the rigidly regimented seating became cheaper the further the occupant was from the ringside.